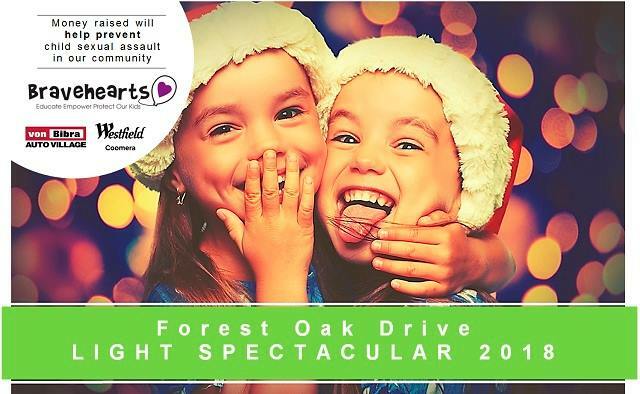 It’s back – Forest Oak Light Spectacular 2018! We all love our childhood Christmas memories and it’s only natural to want our children to experience a magical Christmas they’ll treasure as well. What better way to create a family Christmas tradition than to head out on the road and visit one of the biggest and best Christmas Light Displays the Gold Coast has to offer – Forest Oak Drive Christmas Light Spectacular 2018. Fundraising for Bravehearts – Money raised will help prevent child sexual assault in our community through Bravehearts’ education programs, counselling and support. Traffic Management – Due to the increasing popularity and large number of families expected to visit, a Traffic Management Plan will be in place to ensure the safety and comfort of those attending. From 5pm to 10pm each evening, starting Friday 14 December until Monday 24 December, road closures will be in place at Forest Oak Drive, Upper Coomera. Simply shuttle in, enjoy the lights, and shuttle back – easy. Operating from Friday 14 December until Sunday 23 December, between 5pm and 9pm – further information to be advertised shortly.